Recipe from heartfoundation.org.au. © National Heart Foundation of Australia 2018, reproduced with permission. In a bowl, combine tuna, avocado, coriander, Vietnamese mint and sweet chilli sauce. Fill a bowl with warm water. Place one sheet of rice paper into the bowl at a time, soaking for 20-30 seconds. Carefully place sheets on a damp tea towel. 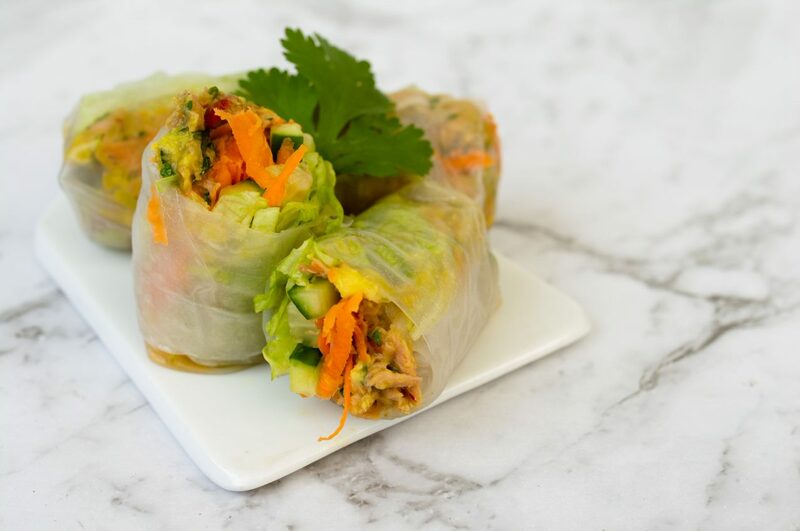 Place iceberg lettuce, carrot, and cucumber in the centre of each piece of rice paper. Top with some of the tuna mixture. Fold in ends, then roll up tightly to form a sealed cylinder. Repeat with remaining mixture to make 8 rice paper rolls. Tip: Tuna can be substituted for egg, chicken or tofu.